Beginning Monday, April 1, and continuing through October (weather permitting), the City’s Utilities Division will be testing and flushing all of Winchester’s 1,200 fire hydrants as part of an annual maintenance program. 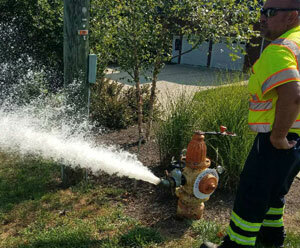 The process of periodically “flushing” fire hydrants is an important preventive maintenance activity and is necessary to maintain a high quality and reliable water system. It is also helps make sure the fire hydrants are fully operational in the event of a fire. As a result of this program, customers may notice some discolored water, but there will be no disruption of service. This discoloration consists primarily of harmless silt and minerals that build up in the water mains which do not affect the water’s safety. If discoloration occurs after crews have flushed the hydrants, run all water faucets for one to two minutes to clear the water. Questions or concerns about hydrant flushing can be directed to the City’s Public Utilities Division at 540-667-1815.